Stop by one of Edmonton Kenworth’s service departments located in our Leduc, West Edmonton, East Edmonton, Lloydminster and Fort McMurray dealerships. 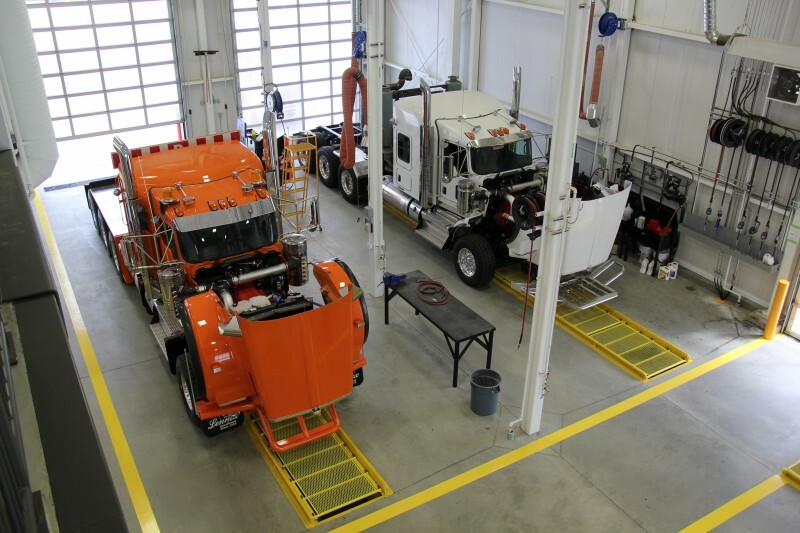 Our service technicians are factory trained and have a wide range of skills that allows us to diagnose and repair virtually anything on any truck.At our Leduc dealership, we offer our technicians an on site training center with state of the art equipment and a Trainer with the most recent factory Training. Also a dedicated truck bay for on the job Practical training! We are an authorized dealer for PACCAR MX, Cat and Cummins engines and we are more than capable of repairing, rebuilding or replacing your engine should the need arise. We have gear specialists in house that are trained to work on SISU, CLARK, EATON, SPICER, and MERITOR components. We also offer welding and fabricating services, general repairs, electronic and electrical repairs and are a Certified Alberta Commercial Vehicle Inspection Station. Edmonton Kenworth’s service departments stay at the leading edge through innovation and technology and we will get you back on the road faster by utilizing our in-house express lube bays, drive through wash bays, wheel alignment pits capable of doing tandem / tandem units (West, Leduc & Lloyd), VisCheck inspection station (West), in floor triple roller chassis dyno (West & Leduc), flywheel machining (West & Leduc), gear rooms and fabrication bays (West, Leduc & Lloyd). In addition to our capable service departments, we operate 10 fully equipped Kenworth T370 service trucks that are available throughout Northern Alberta and are on call 24 hours a day, 7 days a week (3 West / 3 Leduc / 2 Lloyd / 2 Fort McMurray). This fleet is available to all our facilities and is staffed with highly trained technicians to look after all your service needs. Our fleet has state of the art test equipment for diagnosing field problems, and our certified technicians have the expertise (and in most cases the parts) to get you up and running quickly and economically. We minimize your downtime as we come directly to you! A fully tooled rebuild facility that can rebuild components to as new condition, as well as custom work! A Taylor Tri axle 120 inch wide chassis Dynamometers Test Bay that is able to dyno test any truck combination, from a single axle class 7 truck all the way up to a tri axle bed truck with planetary wheel ends. Engine fitness testing, engine break-ins, as well as diagnosing hard to find problems are just a few of the options we offer in this up to date test cell! A heavy duty wheel loader with custom attachments able to quickly and safely pick up a truck that has been towed to our facility for repair. This eliminates expensive yard moves with long waiting times from a towing service. 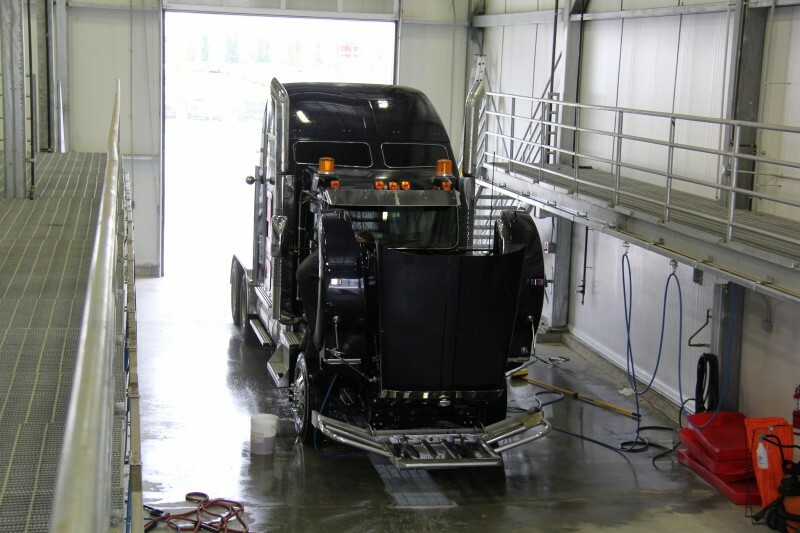 At our Leduc Location we house a seperate 17,000 square foot building featuring four quick-lube service bays for preventative maintenance service, two drive-through wash bays and two alignment bays. Also our drive-through appointment bays that will get you out of the weather while we start your work order! 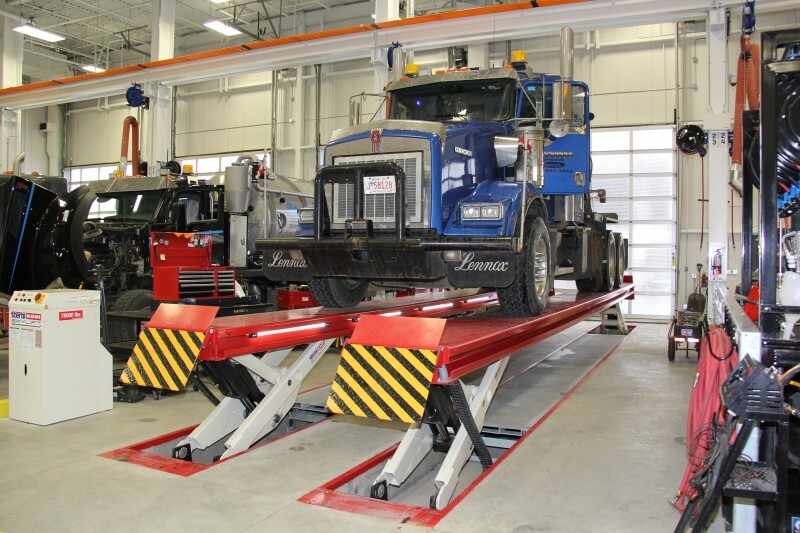 Our Lloydminster Service Department features a fully equipped truck & trailer alignment bay, new truck rig up bays that are capable of all up fit equipment as well as custom work, a 70,000 pound truck hoist, and a fully tooled rebuild facility that can rebuild components to as new condition. We can do Flywheel grinding on site, and have a 48 foot cross draft Paint booth to perform paint & body repairs as well as complete chassis repaints! We also offer state of the art FSX DPF cleaning solutions for all your DPF related issues. We work on all makes and models of HD Trucks, Motor homes & Buses and your insurance repairs are welcome. Our East Side Service Department is fully equipped with 6 Service bays, fully tooled and ready for your repairs. Certified Technicians including Cummins, Caterpillar and Paccar MX engines able to diagnose and Triage problems. Our Fort McMurray Service Department has 2 Service Bays and is equipped with modern diagnostic equipment and tooling. We offer DPF and DOC Cleaning, and are fully licenced for CVIP’s. We have access to the largest Kenworth parts inventory in the area.